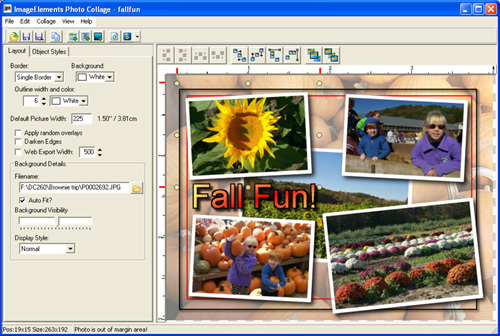 Now you can create collages and montages from your digital photos! Show off your vacation pictures in style! Create a freeform collage posters of your children through the years. Use the program to create custom posters that will be treasured by grandparents, coaches, or teachers. Create any size poster and by adding shadows, captions, borders feathering, and tilt effects you can really create a work of art. Great your holiday gifts now! ...... The collage to the side here took minutes to create, now you can do it too. Drag your pictures from your drive and drop them onto the layout and then arrange them however you want them. Qweas is providing links to ImageElements Photo Collage 1.3 as a courtesy, and makes no representations regarding ImageElements Photo Collage or any other applications or any information related thereto. Any questions, complaints or claims regarding this application ImageElements Photo Collage 1.3 must be directed to the appropriate software vendor. You may click the publisher link of ImageElements Photo Collage on the top of this page to get more details about the vendor.